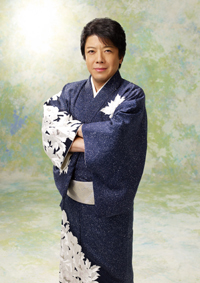 Made his singer debut in 1991 with the song “Otoko no Sake”. Skillfully sings “enka” songs of many different themes (i.e. tear-jerking stories, tenacity), and known the best Japanese singer when it comes to singing about the humanity of the people of Osaka. From when he was child, his father was always very strict about professionalism, for this reason, his MCs at concerts show virtuosity of speech. He has also learnt his dancing skills from his father. Although he had performed with his father, Yukio Hirakawa, many times in the past, the joint concert that took place on October 2006 in celebration of Hirakawa’s 50th anniversary of his career is considered by many as their true “first father and son collaboration”.